Posted on Tuesday, February 3rd, 2015 at 4:28 pm. February is American Heart Month and we believe that a healthy heart starts with a happy heart! At We Olive, we embrace eating well and living well and we believe it’s one life’s most delicious pursuits. This month, we want to see what makes your heart happy. We’re looking for your best photos of delicious and heart healthy food, your favorite heart healthy activities, and, of course, your heart healthy We Olive olive oils. 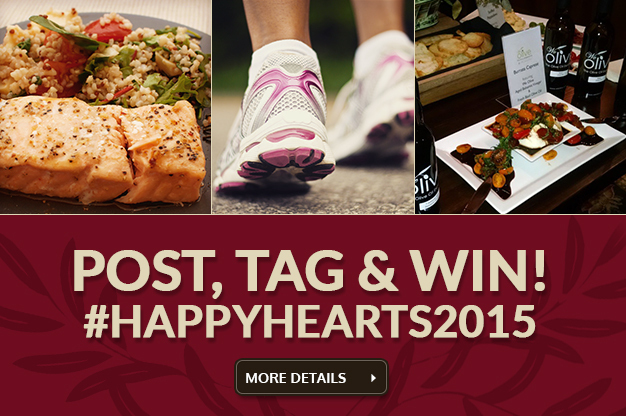 Post photos to your Instagram account with the #HappyHearts2015 hashtag and tag @weolivegrams. Each week, we’ll choose the photo that makes our hearts happiest and you could win a collection EVOO and balsamic vinegars, a gift basket of our best gourmet foods, We Olive gift cards and more! Official Rules:Valid entries must include material as outlined above. Valid entries must use the hashtag #HappyHearts2015 and tag We Olive’s instagram account @weolivegrams in the photo. Entrant must follow We Olive’s instagram account @weolivegrams to submit a valid entry. Valid entries must be submitted between February 1 – 28, 2015. Weekly winners will be announced on February 9, 16, 23 and March 2, 2015. By entering the contest, entrant agrees that We Olive has the right to re-use images entered into the contest.